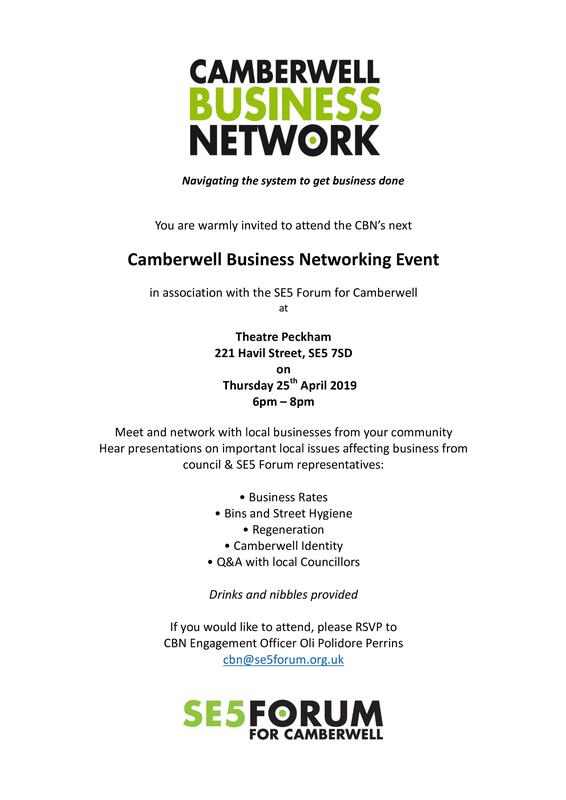 The next free Camberwell Business Network (CBN) engagement and networking event – in association with SE5 Forum for Camberwell – takes place next Thursday 25 April 6-8pm at Theatre Peckham. ALL local businesses are invited to attend for FREE. The event (the second of three free events) is being facilitated by our CBN Engagement Officer Oli Polidore Perrins as part of his brief to create an active business network, support business growth in the area and create an improved retail experience for locals and visitors. Businesses will be able to hear presentations and get advice from councillors, brand experts and SE5 Forum representatives, as well as finding out more about the Camberwell Business Network. SE5 Forum will also be giving a presentation on its current Camberwell Identity project, and how this will support local business. The CBN event will be chaired by our SE5 Forum board member and business lead Will Reeves.